WTI crude prices are in the $42.75/b-$43.00/b range this morning. 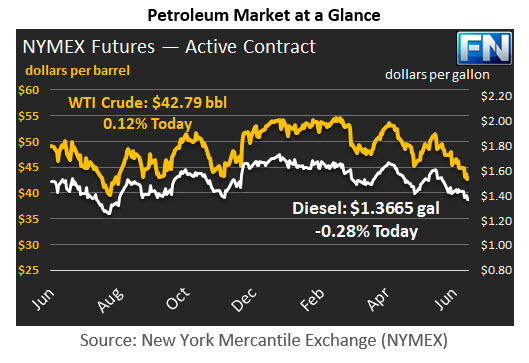 Prices stabilized yesterday, and ended with a slight gain, closing at $42.74/b. WTI opened at $42.80/b today, up by $0.25, or 0.59%, above yesterday’s opening price. Prices have been steady overnight. WTI is currently $42.79/b, up by $0.05 from yesterday’s closing price. Diesel opened at $1.3721/gallon this morning. This was an increase of 1.02 cents (0.75%) above yesterday’s opening price. Current prices are $1.3665/gallon, down by 0.51 cents from yesterday’s closing price. Gasoline opened at $1.4369/gallon today. This was a significant recovery of 2.57 cents, or 1.82%, from yesterday’s opening. Prices are $1.4316/gallon currently, down by 0.29 cents from yesterday’s close. The last four weeks brought continuing evidence of oversupply and burgeoning stockpiles, in the U.S. and globally. This was compounded by weaker-than-expected gasoline demand in the U.S. Each week brought successively lower oil prices. For the current week ended June 16th, the weekly supply data was relatively positive. It failed to motivate a price rally, but it did appear to stabilize the downward trend in prices. WTI prices hit a fresh low of $42.05/b on Wednesday before starting to recoup some losses. The EIA reported a crude stock draw of 2.451 mmbbls, plus gasoline stock draw of 0.578 mmbbls. Distillate stocks increased by 1.079 mmbbls. The EIA data also reported a bounce-back in gasoline demand during the week ended June 16th. Apparent demand had collapsed during the weeks ended June 2nd and June 9th. During the first two weeks of June, apparent gasoline demand averaged 9293 kbpd, more than 300 kbpd below the May average of 9596 kbpd. The new weekly data brought the average demand level up to 9467 kbpd. This still was 129 kbpd below May’s average demand, but the market could view it as a step in the right direction. Global oversupply continues to be the key issue in the market. The OPEC-NOPEC production cuts are being partly offset by production gains in the U.S. and other non-OPEC countries. Judging from futures prices, the market fully expects this to continue. This week appears to be headed for another finish with prices in the red, the fifth week in a row that prices have declined. Details follow in our second article.